Let’s see what we’ve got for you on this cold, wet and miserable day of May. More disgusting news from the US, of course. Even though the world is for obvious reasons more interested in how far they really want to take it with their own Kim Jong-Un, wildlife continues to suffer, and first in the cross-haired sights are wolves. Read the news snippets for yourself. In great contrast to that is that New Zealand has passed an Animal Welfare Bill that now recognizes animals as sentient beings with rights very close to those of humans. See the Other News section! Johnny has made available a biographic obituary of Cheryl Rodrigues, which provides interesting insights not only into the life of an extraordinary woman, but also on how the ZCTF evolved. We have a super-interesting excerpt from the bestselling book, In the Temple of Wolves, by Rick Lamplugh, and we are very grateful to the author for his permission to use it here. If you thought you knew how the original wolf turned into the dog of today or why the Neanderthal died out in spite of his having a larger brain than our species, think again. Rick’s hypotheses are at least as convincing as the commonly accepted ones! As usual, we have a wolf tale for you, and Erin’s updates us on her latest observations. The heartbreaking truth is that when politics get crazy, animals suffer. Wildlife refuge funding gets slashed to the bone. Mining and development overrun wildlife habitats. Wolves and bears die to artificially boost game populations for hunters’ benefit. Laws protecting wildlife are rudely shoved aside. This is perhaps the darkest moment for America’s wildlife in generations. As wolf killing continues in Idaho and other states… As an extremist Congress turns its back on the elephant poaching crisis… The cause of wildlife conservation that you and I hold so dear could be set back by decades! Make no mistake, most Americans believe in protecting imperilled wildlife. But a growing chorus of extremist voices powered by self-interest, hatred and greed has gained the upper hand. In Idaho, more than 2,000 wolves have been killed since Congress stripped them of federal protection. A bill is currently moving through Congress to allow the use of hideous practices to kill bears, wolves and other wildlife on national wildlife refuges in Alaska in order to artificially boost game populations for hunters. An elephant is slaughtered for its tusks every 15 minutes, yet the gun lobby continues to pressure its Congressional allies to halt efforts to stop ivory trafficking. And perhaps worst of all, 100 legislative measures meant to cripple the Endangered Species Act have been proposed this Congress. This is not what most Americans want. You and I are the true voice for wildlife in America. I sincerely believe that with you at our side, we can turn back these appalling attacks. But for many species, we’re running out of time. And thanks to our Board of Directors and National Council, from now until April 30th, your wildlife-saving generosity will go twice as far! With every passing day, another endangered species drifts toward extinction. We have to stop it. There’s no time to lose. Without your contribution, we could not continue our work. Upgrade NOW. Germany: Sad news: Wolf Mt6 has been killed! The Munster Wolf did nothing wrong. So far he had been living in Lower Saxony, just like the Goldensted she-wolf. During my phone call to Mrs. Kottwitz (State Secretary in the Ministry for Environmental Affairs), the Ministry could not give any solid facts to justify the killing of the Munster Wolf. But they did it nevertheless. 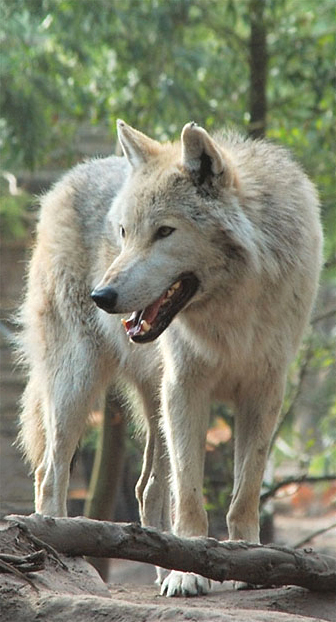 Now an inhibition level to kill more wolves in Lower Saxony, and Germany, has been taken away. With your signature you can send a powerful sign to Hannover that we strongly condemn the killing of Mt6. As soon as we have reached 100,000 signatures with our petition I will take further steps for the protection of our she-wolf. And I promise that they will be of a completely different quality. On top of that, our petition will be discussed by the Lower Saxony’s committee of the Provincial Government in the near future. Now our petition is more important than ever before. Please participate! Help our she-wolf get the 100,000 signatures and end the senseless killing. FORT COLLINS, Colo. (AP) – An anonymous benefactor has stepped in with a key donation for a northern Colorado sanctuary for displaced, abused and neglected captive wolves and wolf dogs. The Coloradoan reported on Tuesday that the W.O.L.F. Sanctuary located west of Fort Collins had been raising money for a $152,500 down payment for a new home in north-western Larimer County. The sanctuary was $85,000 short and closing in on a Thursday deadline set by the owner when it got an anonymous donation. 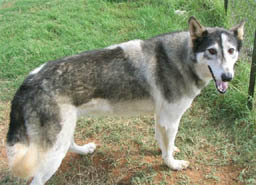 The sanctuary currently houses 29 wolves and wolf dogs, with a capacity for 30. Animals that are taken in become lifelong residents. Executive Director Shelley Coldiron hopes the shelter can gradually expand to up to 60 animals in the new location. Two nine-day-old wolf pups born at the St. Louis–based Endangered Wolf Center were flown to New Mexico and introduced to their new wild pack April 23. The technique of inserting captive-born pups into wild dens has never been tried with Mexican wolves, according to the center’s director, Regina Mossotti. 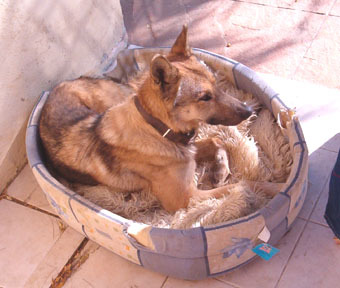 If the attempt is successful, the surrogate mother will raise the introduced pups as her own. The new pack is also known as the Sheepherder’s Baseball Pack. 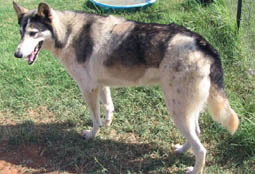 The new pack has been recognized in New Mexico and consists of F1392 who was born into the Prieto Pack in 2014 and M1284 born in 2012 into the Luna Pack. M1284 was given his name, “Krypto”, in our first pup naming contest and F1392 received her name “Tempesta”, by a brother sister team from Italy. 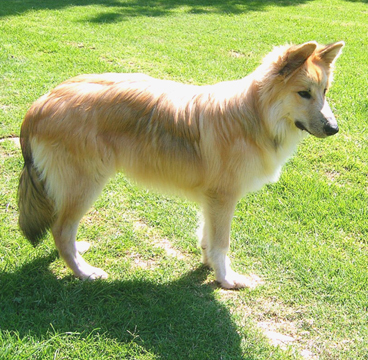 Krypto separated from the Luna Pack in 2014 and remained single until this past winter. They have been travelling together for the past three months and have been designated as the SBP Pack. Environmentalists filed the complaint Monday with the Oregon Government Ethics Commission against Reps. Greg Barreto, R-Cove, Brad Witt, D-Clatsakanie, and Sal Esquivel, R-Medford. The Oregon Court of Appeals cited the bill last month when tossing out a lawsuit filed by environmentalists trying to reverse a state decision to remove the gray wolf from the endangered species list. Gov. Kate Brown signed the bill in March, soon after lawmakers approved it in the final hours of the 2016 legislative session. The ethics complaint says the lawmakers in February repeatedly denied that the bill’s purpose was to intervene in the courtroom. 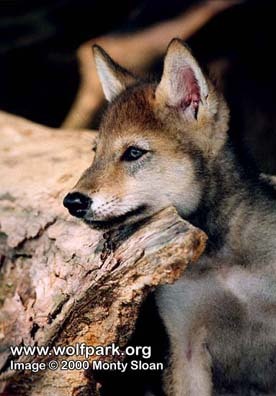 To say that the red wolf is an endangered species would be an understatement. Only 50 red wolves remain in the wild, all within five counties of northeastern North Carolina. These predators used to roam from Pennsylvania to Florida but could soon become extinct if drastic measures aren’t taken. What’s most alarming is that the U.S. 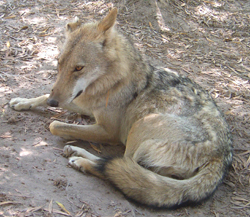 Fish and Wildlife Service had a recovery program in place that had kept red wolves safe for a number of decades, but have since allowed the program to dwindle due to inaction and compromising with anti-wolf agendas. Tell the FWS to step up their game and save this species before it’s too late. Cheryl was born on the 15th December 1956 in sunny Rhodesia. She comes from a family of avid motorcycle enthusiasts and rode a motorcycle herself in her youth. As a young girl, she was labelled as “quite a tough cookie” and some what a bit of a tom boy. She was only 5ft tall but nothing stopped her fiery, witty and determined spirit from achieving anything that she set her mind to. As well as riding motorbikes, and racing her cousin’s go kart around the farm roads, affectionately named “the race track”. She also did a spot of ballet, which she hated. I think her parents were trying to encourage her to be more like a girl. She made all the clothes she wore too. Cheryl was a stunning woman with brownish black hair and beautiful brown eyes which would captivate your soul if you ever did have the pleasure of meeting her. She was a very intelligent lady who excelled at school and wanted to go onto university. Her command of the English language was exemplary as well as her artistic skills and she could play the piano and piano accordion by ear fluently. Cheryl painted some of the most beautiful works of art, which people would ask if they were in fact paintings or photographs. Her attention to detail was impeccable. Cheryl met my Dad, Johnny Rodrigues in 1974. She was crossing the road in front of his car which was parked at the robots…..he had never seen such a beautiful woman in all his life. He told her that he would be coming to visit that afternoon, to which she aptly replied…”well, I won’t be there”. On arriving at her house in the morning, as promised, she had gone off on her motorbike to the swimming pool. On her return, later that afternoon, Johnny then told her that he was going to marry her; her response was “sure buck”. Needless to say, they fell madly in love and were married in a Roman Catholic Cathedral. A year later, Lorraine came along followed by Brigitte and later on Shane. During Cheryl’s 42 years of married life to her love, Johnny, she played soft ball and was selected to play on an all girls football team in the Curry Cup in South Africa which she received her Provincial colours for. After relocating back to Zimbabwe she was selected to fish for Zimbabwe under the National Bank Angling Team and fished the Tri- Nations International in Namibia and did very well. She received her National colours as a result of her efforts. Cheryl also started writing a book about the ZCTF and Johnny, which she only completed 12 chapters, which we hope to complete and make it available to the public so everyone can hear her story. She supported her husband Johnny, her children, grandchildren and son in-law Gavin, wholeheartedly in everything they did. She was Johnny’s fishing partner attended all the car races that he and their children competed in as well as supported her children in their karate at the World Championships in 2014 where her daughter Lorraine and grand-daughter Kylie both won silver medals. Her son Shane has also made a name for himself with his life like pencil drawings of animals too. Cheryl always loved animals. In 1998, Johnny and Cheryl formed The Zimbabwe Conservation Task Force. Cheryl would do oil paintings of the animal’s native to Zimbabwe to try and raise awareness and funds to help the ZCTF grow. The funds raised were used to help send anti poaching units run by Johnny in the Kariba area to stop the netting of tiger fish. They also raised funds towards saving Hwange when it was hit by the severe drought in 2005. The ZCTF bought fuel, spares for pumps, uniforms and boots and assisted towards the National Park’s ranger’s wages during that time. Cheryl accompanied Johnny on one of the trips to Hwange to deliver the first batch of 10 000 litres of fuel, from a total of 65 000 litres actually delivered. After installing the pumps and the water began to pump into the pan, they witnessed the thirsty animals coming out of the bushes to drink the much needed water. Many different species came down to the watering hole that day. Cheryl was awe struck by the euphoric atmosphere in the air whilst the animals drank water at the same time…… they did not sleep that night, they sat at the watering hole savouring the moment before them. There are so many instances whereby the efforts of Johnny and Cheryl resulted in animals being relocated to safer areas, M99 being purchased for the local vets too. Only a few of their accomplishments have been spoken about as there are too many to mention. This was all made possible from the proceeds of Cheryl’s paintings and the many donations that came in from animal lovers all over the world. Cheryl sat tirelessly for days and nights sending out the ZCTF reports and helped Johnny expose the truth about the famous Lion, Cecil who was killed by the infamous Walter Palmer. This led to the Cecil Act being passed by the US government preventing all imports of trophy hunts from Zimbabwe into America as well as many air lines coming on board to stop the transportation of any trophies in the future. The United Nations have tabled a wildlife act to protect all endangered wildlife and aquatic life around the world. We still await the outcome of their decision. There will be a Cecil rally in Washington DC, USA on the 30th July 2016 in honour of Cecil and the growing continuous efforts to save the endangered lion. This has all come about because of the Cecil Act, the King of the Jungle, Cecil, never died in vain. To date this has to be one of the greatest achievements accomplished by the ZCTF and for conservation world wide. Today, the world has lost a great conservationist; a lover of all things created by God and has left us empty, full of despair and sorrow. Although she has taken a leave of absence to go and help God care for Cecil the Lion and Tusker the Elephant and the animals she so dearly loved and tried to save, she did leave us with one thing………..her legacy. A legacy that will live on in our hearts forever and that we will continue to fight for the animals until our last breath and we meet her again because she wouldn’t have had it any other way. The quote above written by John Kay, pretty much sums up everything my Mom, Cheryl Rodrigues, believed in and lived by……..
For hundreds of thousands of years, wolves dogged herds of reindeer that migrated between what is now Spain and Siberia. 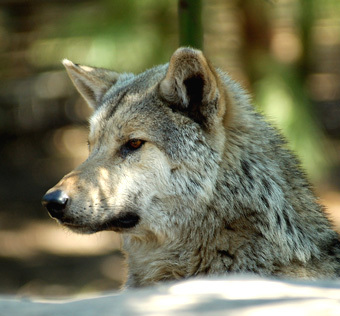 After the last Ice Age, perhaps 10,000 years ago, early humans may have seen wolves bringing down reindeer, say Wolfgang Schleidt and Michael Shalter in the journal article “Coevolution of Humans and Canids.” Our ancestors may have been as hungry as those wolves. But they couldn’t hunt as well. Stomachs growling, they puzzled over how to plunder some of their competitor’s bounty. A couple of early humans–no matter how hungry–couldn’t just take a pack’s kill. They were no match for wolves. But early humans were superior to their competitor in some ways, say Schleidt and Shalter. Humans have greater cognitive ability. Humans can see better at longer distances, because we stand taller than wolves. Humans with weapons could hit a target from a distance. These strengths could have enabled early humans to assist wolves in hunting. Ancient wolves, as they do now, hunted by sorting and sifting a herd to expose the animal that required the least effort to bring down. After wolves cut that animal from the herd, it would eventually stop and face its attackers. Then the wolves would begin the dangerous work of bringing down a much bigger animal. But that standing animal could be more easily brought down by humans with weapons. Working together, a meal was won using the strengths of both predators, and the partners shared the spoils. There is even more evidence that wolves helped humans survive. Last year an anthropologist, Pat Shipman, wrote a book, The Invaders: How Humans and Their Dogs Drove Neanderthals to Extinction. She also theorizes that early humans partnered with wolves. But she adds a twist: that alliance gave our ancestors an unbeatable advantage over our competitor, the Neanderthals. “Early wolf-dogs would have tracked and harassed animals like elk and bison and would have hounded them until they tired. Then humans would have killed them with spears or bows and arrows.” In addition to helping with the hunt, wolf-dogs would have kept rival carnivores and scavengers from stealing the kill—just as wolves protect their kills today. 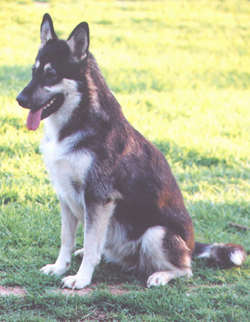 These ancient wolf-dogs were not the same as modern wolves or modern dogs, were not a hybrid of wolves and dogs. 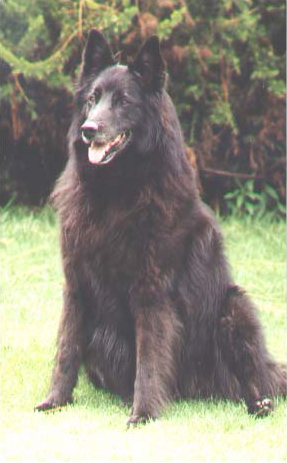 Shipman told Simon Worrall of National Geographic that wolf-dogs had characteristics similar to those of today’s wolves, but they were a distinct group. Large and built for hunting, they had big teeth and a great sense of smell and could run long and fast. Modern humans won the evolutionary race. And we have our partners the wolves to thank for some of that victory. As centuries passed, this partnership evolved into wolves becoming dogs. The commonly held view of that domestication is that humans chose the lazy, opportunistic, outcast-from-the-pack wolves that scavenged at human camps. 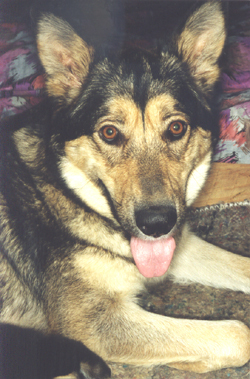 But Schleidt and Shalter present an alternate—and intriguing—possibility of unrecorded history: “…scavenging wolves took the initiative and conned the affluent hunting and gathering humans into sharing their plenty, by pretending to be their obedient servants and hunting companions.” In other words, wolves may have chosen and trained us, much to our benefit. The impact of wolves on human development could be even greater. Wolves and humans are similar in two important ways. 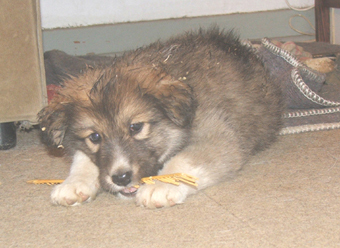 Both survive by cooperating in group activities, such as taking care of young or hunting. Both share risks among group members. Schleidt and Shalter hypothesize that humans may have improved these two survival skills by studying wolves. 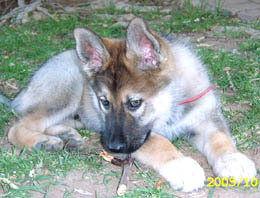 We apprenticed with wolves and then with our bigger brains and the ability to develop technology, “Humans became better gatherers, better hunters, more successful fishermen, gardeners, astronauts, you name it.” Wolves, domesticated to dogs, became our hunting companions, guards, beasts of burden, playmates, and baby substitutes. 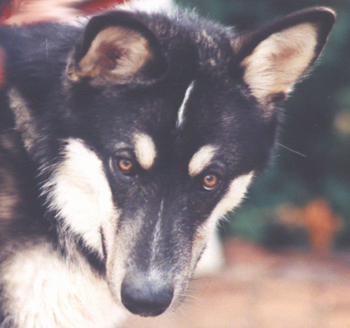 Mark Derr offers another view of the wolf-to-dog transition in his book How the Dog Became the Dog. He does not see wolves as curs slinking around the edge of a human settlement begging for handouts and eventually tamed by intelligent humans. 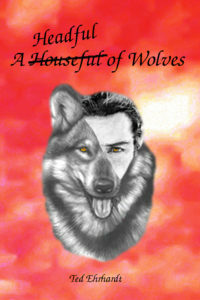 He writes that the partnership with wolves occurred before early humans even had settlements. Certain nomadic humans and wolves met on the trail and were simply right for one another; were both sociable and curious. Those initial connections were no small thing for either party. The first wolves to take up with humans were exceptional animals capable of making what Derr calls “a leap of friendship” with a creature from another species. 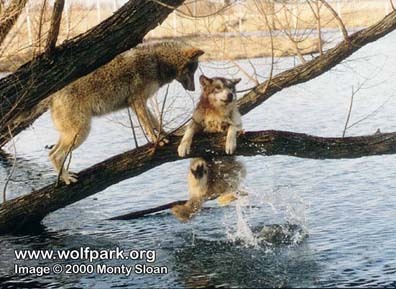 Once that leap was made, early human and wolves evolved together. Our ancestors learned a few tricks from wolves—and returned the favour. Early human hunters, writes Derr, were ambushers, while the more experienced wolves were pursuit hunters. 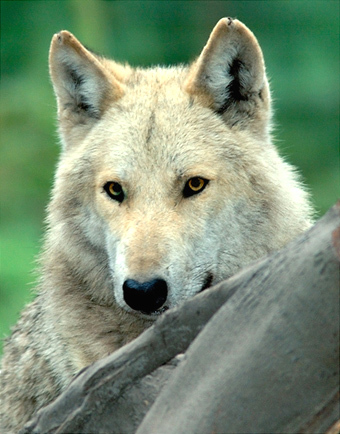 Humans observed wolves and learned to hunt by stampeding prey. This method produced more meat than the humans could eat or carry away and they left the remains for wolves and scavengers. 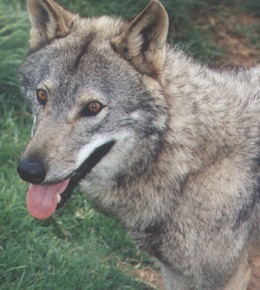 Wolves ate their fill and learned that they could benefit from human hunters. Derr’s image of two intelligent and resourceful creatures meeting on the trail, befriending one another, and evolving together is an important addition to wolf natural history. No one knows for sure how humans and wolves met or how wolves started their long journey to dog hood. 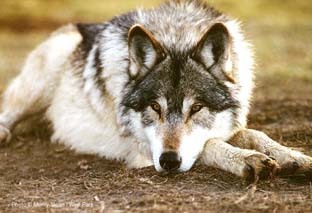 But I think that how we view wolves historically is critical to how we treat them today. Consider this scenario: You’re in the market for a dog and you go to a reputable breeder. She has two dogs from which you can choose. The dogs look similar. You ask about each. She points to one and says, “Oh, his parents hung out by my trash pile. They’re just scavengers.” Then she points at the other and says, “This one’s parents were two of my best friends. They were intelligent, attentive, and curious.” Which animal would you take as one you will love and care for? Which might you keep at a distance or demonize? 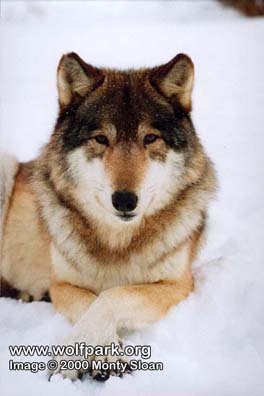 As I see it, ancient wolves were intelligent enough to grasp the advantage of working with our ancestors. Ancient wolves were generous enough to share their hard-earned kills. Ancient wolves were brave enough to make that leap of friendship with a competitive species. With the help of those wolves, we improved our hunting skills and our chances of survival. With the help of those wolves, we out-competed Neanderthals. In the end, we became top predators with powerful arsenals and few thoughts of long-term consequences. And, sadly, we came to hate wolves and treat them as unacceptable competitors for game and livestock. We forgot the debt we owe these fine creatures that befriended and taught us. The heat blaring down on the desert floor, as Akeema walked on, forever more. Her four legs were getting weary from travel, as she trudged on, over the sandy gravel. Panting for thirst, she looks to the sky, Buzzards circling above, as they glide. She finds shade from very tall cacti, to seek comfort from the sun in the sky. She licks her paws of very sore wounds, grimacing with pain, as she licks and grooms. The shade fades away, as the sun slowly sets, Akeema rises slowly, so to begin her quests. She’s full of spirit, never giving up, to find the right place, to raise her pups. A pup or two she carries, waiting for birth, heavy weight she carries, inside her girth. She comes upon some carrion, on which she feasts, filling her stomach, on the gruesome dead beast. Not far from the remains, was a shaded water hole, she thinks she has finally reached her destined goal. Here she will sleep, heal, and make it her den, and hopefully protect herself from all men. Akeema sups from the hole to quench her thirst, oh it tasted so fine, it had to be first. Secondly, she would lie down and take to rest, as the sun would start setting in the West. She sleeps and dreams of her journey’s miles, treacherous terrain, in which she trials. Kicking in her sleep, as she continues to dream, hoping to find, that beautiful stream. She is startled, by the screeching of a nearby owl, seeing the moon, she lets out a hoarse howl. How…how…howlll…, She halts with an abrupt gasp, she swallows some water, before she starts to rasp. 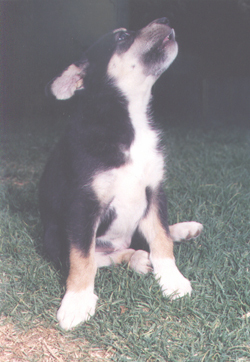 How…how…howwwwllll.., she howls with pride, echoing in the distance, as it whispers in the night. She is staking her claim, at this watering site, to protect her pups, from dawn to night. She will raise them here, with pride and stern, to praise them from that, of what they learn. The crickets chirp, their symphonic crescendo sound, as she sleeps in the home she found. It looks like summer is over for good (sadly); most days are still o.k., but you can feel the typical winter-chill on the wind, the nights are pretty cool now, and it seems to be raining everywhere but here. While I enjoy working in the garden without feeling like being in a sauna I do not at all like the cold of the evenings and nights. That’s the time when I hate early mornings and try to stay in bed for as long as possible. The one good thing is that this is also the time for hot chocolates and teas in the evenings. Our pack couldn’t care less about my winter blues, they rather enjoy the cool weather, although they do come inside earlier now and cuddle up on our bed and their mattresses with the noses pushed deep into their bushy tails instead of spending the nights on the cold kitchen floor, as they do in summer. In the moment everything is just fine here, but that may change soon. Our municipality has decided to tar our sand road, which, in one way, is good because it will hopefully make the area less dusty, especially during the winter months, but on the other hand … it will be very irritating for the pack to have strange people working on the road the whole day, using noisy machines and stinking stuff. Ascar II and Kajack II will be on high alert around the clock, and our somewhat neurotic Taima will most likely refuse to eat and hide inside the house. They are not used to loud noises and lots of people so close to their territory, and Ted and I fear that all this will cause them a lot of stress (well, us too, I guess), and a road of about 1.5 km is not prepared and tarred within just a day or two. Taima has developed a new favourite hobby: grooming Athaba and Kajack’s coats several times a day. She will push her nose into their fur, sniffing out whatever it is, and then “comb” their hair with her front tees. It looks as though she chews the hair with her front teeth, nibbling through it at quite some speed. It looks rather funny, and the boys are not allowed to get up and walk away as long as she is still busy. They have to sit still and stop any other activity, no matter what they have been busy with, until she says otherwise. When she decides it is grooming time they will just have to obey or else… The interesting part is that she very clearly chooses the parts of their bodies they cannot reach themselves for grooming. And funny enough, we have never seen one of the boys grooming her or each other. Surely, they lick each other’s faces and ears from time to time, but when it comes to grooming, it was always everyone for themselves, at least till now. That’s again something we are not sure of what is behind it and why only she does it. Shows you that even after so many years of living with these animals, there is still something new to learn.